I love falooda, but I’m still not the biggest fan of all the seeds and jelly like things in them. When I was little, my mum would very kindly make a separate one just for me without all the bits inside! Sometimes she’d also pour it into an ice cube tray to make little falooda ice cubes… which were amazing and perfect on hot summer days! 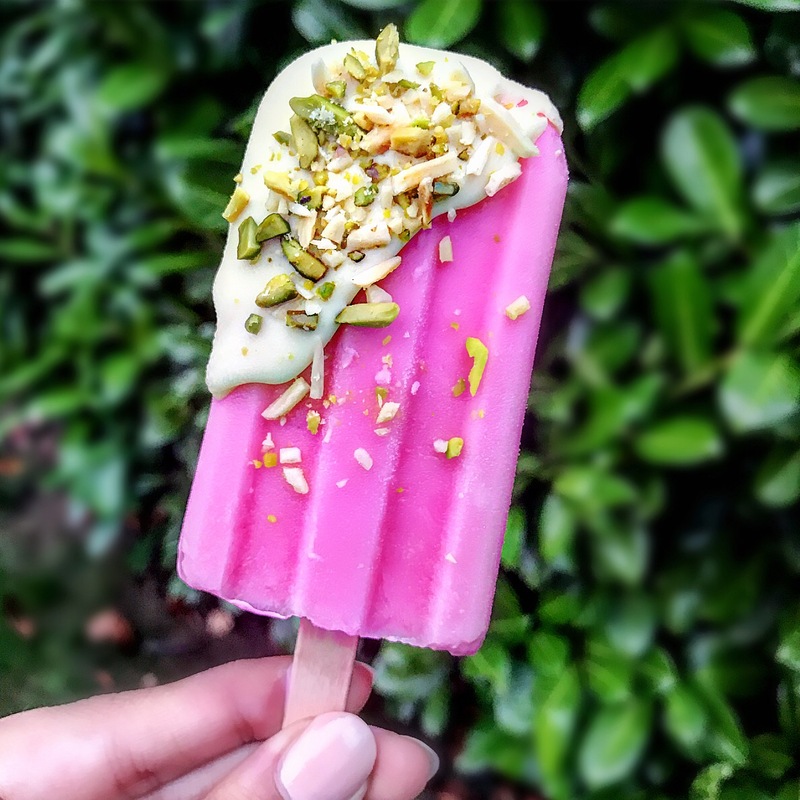 Feeling nostalgic, and having tried this epic ice cream in Singapore, I decided to experiment with a rose flavoured ice lolly coated in white chocolate and pistachios. It turned out great and I think it’s a nice idea for Eid, especially now that the sun has decided to shine again! I hope you like it and be sure to let me know if you try it out! Simply stir together the yoghurt, rose syrup and milk in a jug. Pour the mixture in an ice lolly mould and freeze for at least 4 hours. Quickly dip the ice lollies in the melted white chocolate and sprinkle pistachios immediately whilst wet. What an amazingly simple sweet treat. Gotta make it for my girls!